I recently had a chat with a colleague who is trying to automate RTC Work Item creation. As a casual user without administration experience they where wondering how to find the IDs for the work item types to be able to create work items of the types in WCL. Today you must know the ID of the work item and look them up in the administration UI. I always wanted to add the ability to be able to list the available work item types in WCL, but for whatever reason I never got to searching the API and add it to WCL. Having some time last week I took the opportunity to finally implement it. This closes a last big gap that WCL left open. Users can now print the work item types and with that information print the attributes available on the work item type. A small description how to use WCL can be found here. WCL prints a help if the command is omitted. The help information is very long. Make sure to redirect it into a file or increase the shell buffer size. This post provides the code for the latest version of WCL and also a description how to install WCL. WCL is released under the MIT License. See the License.txt and the license headers in the individual files. This code has been used with RTC 4.x, 5.x and 6.x with no or minimal changes and it is pretty safe to assume, that the code will work with newer versions of RTC to come. The code requires the RTC Plain Java Client Libraries. 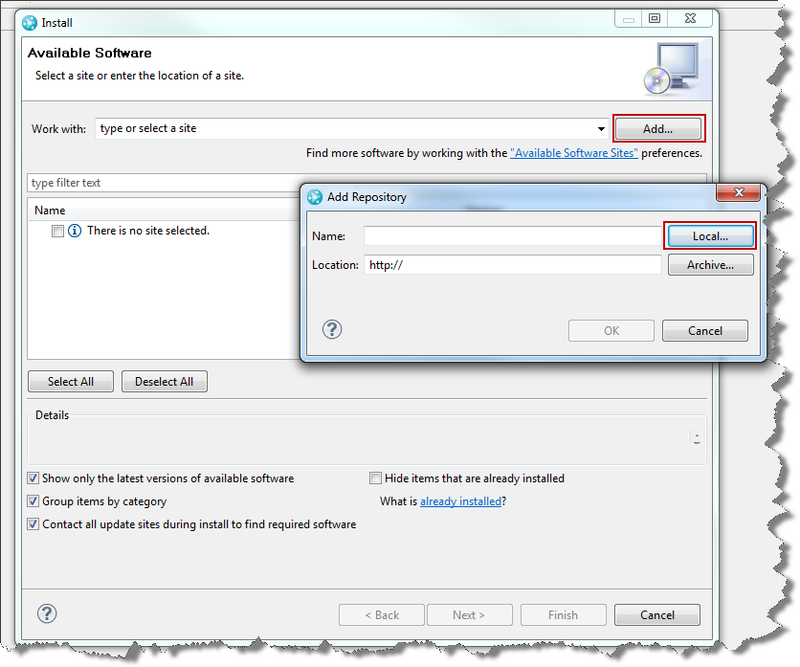 The Export and import commands require additional external libraries that need to be downloaded and installed separately. See the document below. The code is available in the Jazz Community. WCL 4.1 is available in this release. Added a command printtypes to list the work item types available for a project area. wcl -printtypes repository="https://clm.example.com:9443/ccm" user=ralph password=****** projectArea="JKE Banking (Change Management)"
The Type ID is the work item type ID required to set and get work item information. 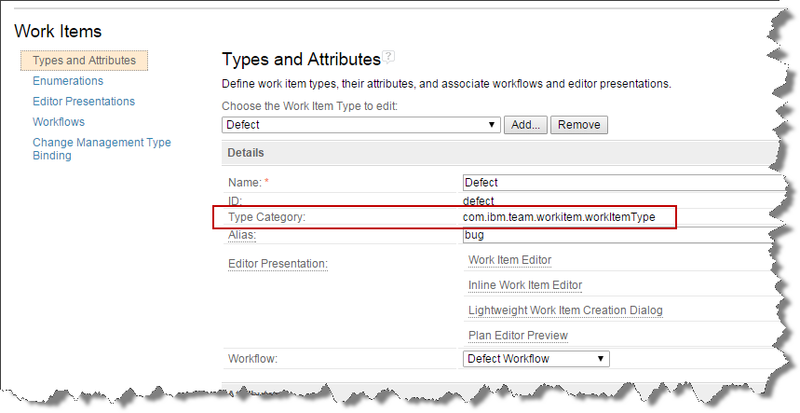 The type category is an additional information to understand if work item types have the same workflow. WCL requires at least the RTC Plain Java Client Libraries for your version of RTC. To download that, open the All Downloads tab of the RTC version you are interested in. For example https://jazz.net/downloads/rational-team-concert/releases/6.0.5?p=allDownloads and scroll down to the Plain .zip Files section. Download the RTC Plain Java Client Libraries file. Use 7Zip and unzip the RTC Plain Java client Libraries download file (for example named RTC-Client-plainJavaLib-6.0.5.zip). Use 7Zips Extract Files command and provide the extraction Path for example C:\RTCWCL\PlainJavaAPI. Remember the location for later. Optional: Download the Plain Java Client Libraries API documentation and extract it to the same folder you extracted the RTC Plain Java client Libraries download. The following sections explain the first method. To package your own version of WCL for release from the source code, setup your development environment as described in the next section. Then follow the document ReadMe – HowToRelease.txt in the eclipse project com.ibm.js.team.workitem.commandline you can find in the source code to package WCL. If you download the packaged, executable application latest version 4.1, the download is already packaged and prepared. The downloaded file is compressed and will be named like WCL_V4.1_20180323.zip. Extract the WCL package file e.g. using 7Zip to a folder, for example C:\RTCWCL. The folders structure should look as below. To work, the WCL needs a Java JRE or JDK. Open the file wcl.bat or wcl.sh. Provide a JRE or JDK. I Usually use a JRE that comes with the CCM server or a JDK that comes with the Eclipse client. However any compatible JRE should do. Change the JAVA_HOME variable to point to a location containing a JRE. If needed, remove the path section JRE from the final call. If you installed the Plain Java Client Libraries API into a different location, set the variable PLAIN_JAVA to that folder location. The export and the import commands of WCL need two libraries that are not shipped with the downloads. If you use the packaged WCL and want to use the export/import capability follow the steps below to add the required libraries to the folder lib in the folder lib in the WCL folder. If you use the Eclipse project for WCL and want to use the export/import capability follow the steps below to add the required libraries to the folder lib in the Eclipse project com.ibm.js.team.workitem.commandline. The export and the import commands of WCL use the Open CSV Library. I had issues with the newer versions of Open CSV that I could not resolve, so this code assumes the version 3.7. Download the version 3.7 from here. Uncompress and untar the the file opencsv-3.7-src-with-libs.tar.gz you downloaded. Look for the folder opencsv-3.7 deploy\ copy the JAR file opencsv-3.7.jar and put it into the lib folder of your version of WCL. It is possible to use other such libraries like SuperCSV with minor changes to the source code as well. The import commands of WCL can only provide the capability to use a mapping file by using a JAR file that only ships with the RTC Eclipse client and the SDK. The classes used for the mapping file capability are located in the library com.ibm.team.workitem.rcp.core. 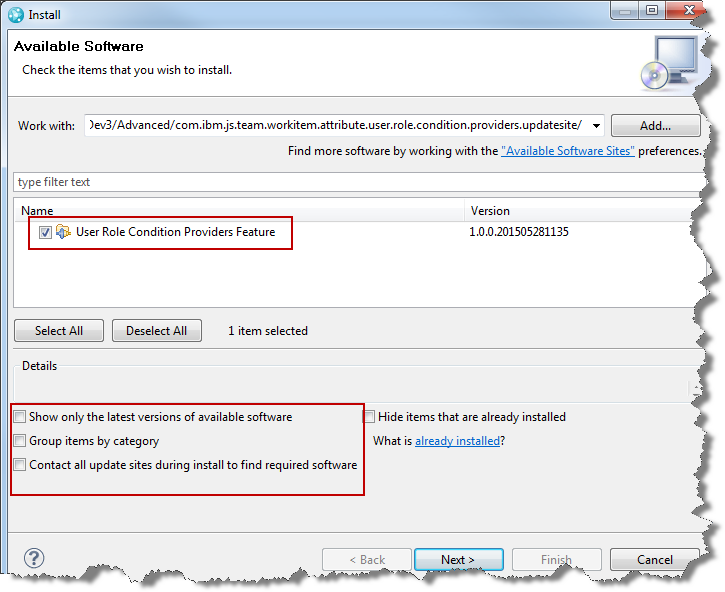 Open the Install location of the RTC Eclipse client and search for com.ibm.team.workitem.rcp.core*. 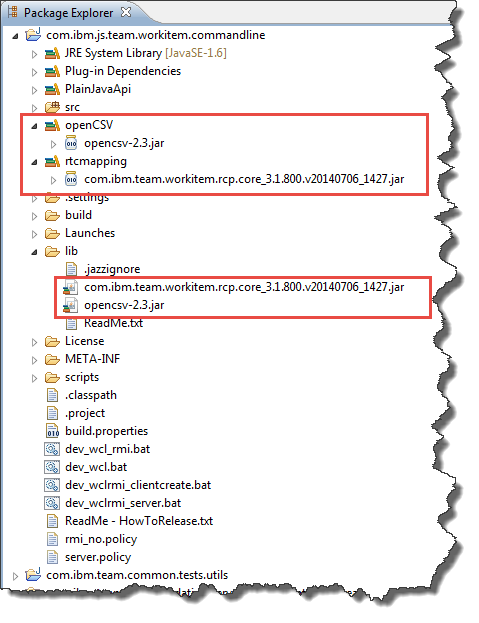 You should find a file names similar to this one: com.ibm.team.workitem.rcp.core_3.1.900.v20141010_0124.jar. The version numbers at the end could be different. Copy the JAR file into the into the lib folder of your version of WCL. The best approach to develop for the RTC Java APIs is, to setup the development environment based on the RTC SDK . This provides with the source code for the API and allows to search examples. This saves so much time in the long run that saving the effort of setting the SDK makes no sense. So follow the instructions in the next section. Get the source code from the Jazz Community. 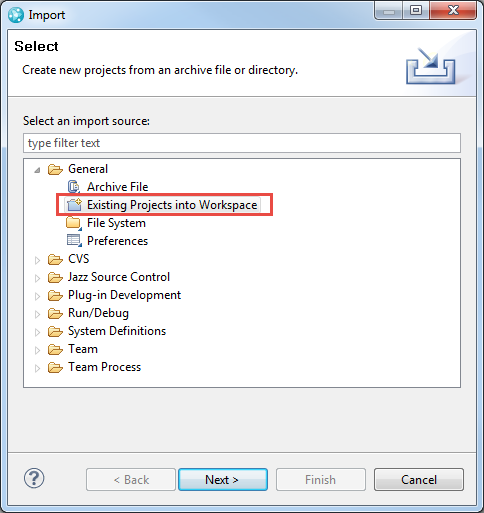 Use Git to clone the project and import the source project into Eclipse. You can also download the source as a zip file and import the project with the other Eclipse Import wizards. Switch to the Java perspective or the Plug in Development perspective. The folders contain the information to build the jar file, to run the and debug the code, folder for additional libraries and the scripts to run the Java application from a shell. 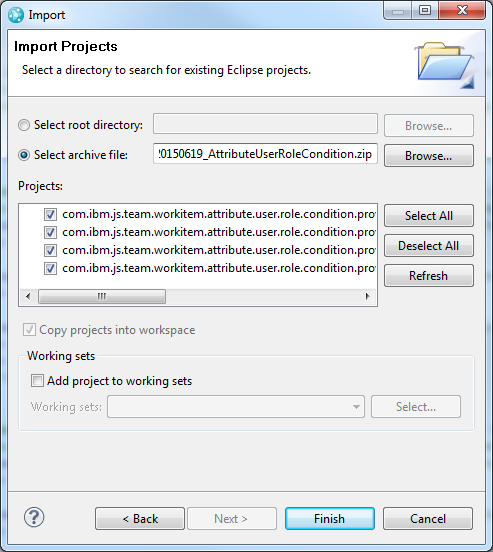 The Eclipse project is a Plug-in development project. This trick provides the access to the SDK and the API source code. The project references the Plain Java Client Libraries and needs them to run. So the minimum additional step needed to be able to run the WCL for development in Eclipse is to install the RTC Plain Java Client Libraries as a user library. The Plain Java Client Libraries have already been downloaded and installed. The same folder with the install can be used in the next steps. Open Windows>Preferences and type “User lib” into the search window. In the Java>Build Path User Libraries click the New… button. Type the name that is alreay referenced: PlainJavaAp. Click OK.
Browse to the folder containing the Plain Java Client Libraries C:\RTCWCL\PlainJavaAPI in this example. Select all JAR files and click open. The User Library should now contain the libraries. Go back to the section “Provide Additional Libraries” and add the libraries to the folder lib. Make sure the libraries are available. Remove and re add the jar files to the build path if needed. You should now be able to run or debug the WCL from within Eclipse. The debug configurations shipped with the source code in the Launches folder are now available under the Debug>Debug Configuration section. Change the configurations as needed. To package your own version of WCL for release from the source code, follow the document ReadMe – HowToRelease.txt in the eclipse project com.ibm.js.team.workitem.commandline you can find in the source code to package WCL. You should now be able to start working on WCL and enhance it if needed. I hope this document helps the many users out there. Rational Team Concert (RTC) has a built-in feature to view the history of a work item. But especially for work items with many changes, it is hard to follow the Status of a work item over time. That’s why Lukas created the amazing Status History Presentation for RTC and published it in the DACH Jazz Community project. 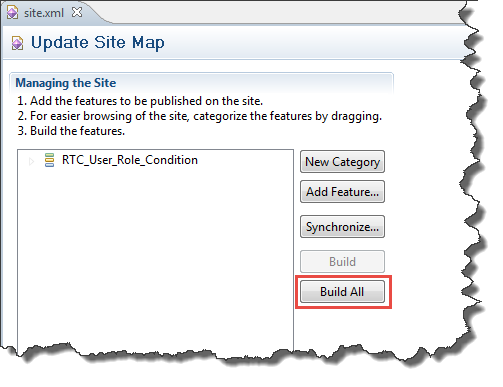 It shows all Status changes since the creation of the work item in form of a timeline in the RTC work item Web UI. Follow the instructions in the Status History Presentation for RTC project to download and install the editor presentation server extension. The Open Source project also serves as a great example for how to write a custom editor presentation. Many thanks to the DACH Jazz Community for sharing their amazing work. A lot of users try Java Script based attribute customization and often run into issues. They ask on the Jazz.net forum to get the issue solved. Unfortunately the questions usually lack the information required to help. This post explains how to retrieve log information to be able to provide this information. Where are the Script Log files? Java Script attribute customization can use the console to log text messages into a log file. The question is, where are the log files? Please note that the logging information is not in the RTC Application log file CCM.log. The Jazz.net Wiki entry about attribute customization provides hints about how to log data and how to log data and how to debug scripts in the section Debugging Scripts. Similar information is provided in the Process Enactment Workshop for the Rational solution for Collaborative Lifecycle Management. Unfortunately both only talk about how to find the server log information for Tomcat. Since Websphere Application Server and WAS Liberty are also valid options, how can one find the log files in this case? As background, note that the Eclipse Client as well as the RTC Server are based on Eclipse technology. This common technology is used to log the data and determines the log file location and name. Each running Eclipse has a workspace location and stores meta data and log information in this workspace. The workspace is basically a folder in the file system. The metadata is stored in a sub folder with the name .metadata. The log file is in this folder and named .log. For the RTC Eclipse client and for scripts that run in this context, open the Eclipse workspace folder that is used and find the .log file in the .metadata folder. For the RTC Server, the easiest way to find this workspace and the enclosed log file that I have been able to find is to search for the folder .metadata. For Tomcat and WAS Liberty standard installs go to the folder where the RTC Server was installed and then into the sub folder server. From here search for the folder .metadata. For Websphere Application Server (WAS) go the profile folder for the profile that includes the RTC server deploy and search there. Note that every Jazz application has its own Eclipse workspace with metadata folder and workspace log file. The one interesting for RTC attribute customization is the workspace of the RTC server. The folder structure includes the context root of the Jazz application. Each application has a different context root which typically matches the application war files name prefix. The RTC application typically has the context root and application war files name prefix ccm. Open the workspace for this application and find the log file. You can look into the log file. Please make sure to use a tool that does not block writing to the log file, while you are browsing its content. The log file is kept open by the server when it is running and blocking it from writing is not what is desired. Use more or an editor that reads the file and does not block it. For windows users: notepad does lock the file for writing. Use a different tool such as notepad++. The Process Enactment Workshop for the Rational solution for Collaborative Lifecycle Management provides some examples for how logs look like and can be created. If you can’t find the log entry you are looking for, always check the server log as well. Maybe the script runs in a different context than you expect. It might happen, that an expected log entry is not found in any of the log files. In this case make sure to check for script loading errors as well as thrown exceptions at the time the script was supposed to run. Load errors can be caused by different reasons. One reason can be that attachment scripts are not enabled. There are enough indicators in the Attribute customization editor in Eclipse that a user should have spotted this these days. Using the debugging techniques explained in the Wiki entry in the section Debugging Scripts and in the Process Enactment Workshop for the Rational solution for Collaborative Lifecycle Management should be the preferred option and is usually more effective. Looking at the logs is still a valid option, especially to be able to log execution times and to find script loading issues and for scripts that are run in the background in the server context, such as conditions. I found using the Chrome Browser and the built in Developer Tools to be most effective. The scripts can easily be found in the sources tab under the node (no domain). Make sure to enable the debug mode as explained here: Debugging Scripts. 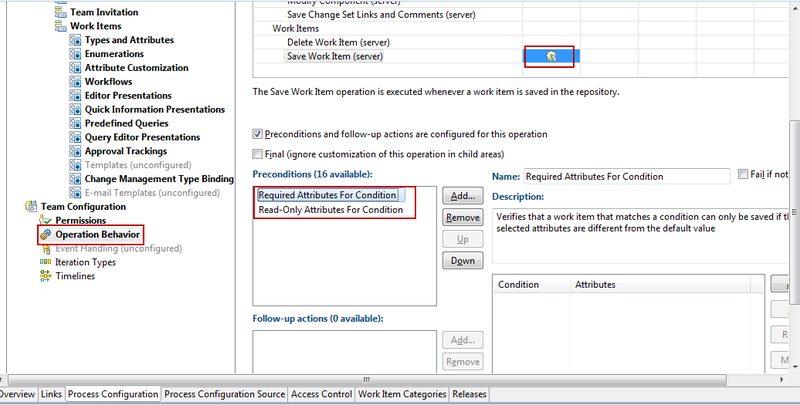 This is the second post in the series around very fine grained access control permissions for work items and RTC SCM versionables. It explains how to set the access control permissions for work items. This code has been used with RTC 5.0.2 and is prepared to be used with RTC 6.0.x with no changes and it is pretty safe to assume, that the code will work with newer versions of RTC. 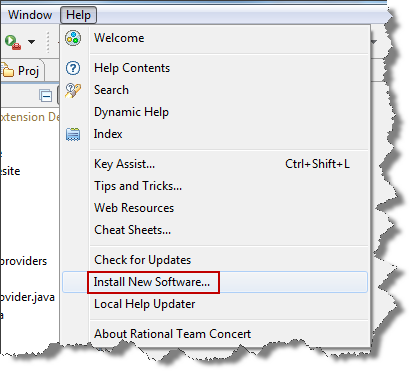 The code in this post uses common libraries/services that are available in the Plain Java Client, Eclipse client and Jazz Eclipse server API. If client or server API is used, this is stated. Now that we have all the rules and pieces together as explained in this post, lets have a look at the work item access control. Again, note, that work items can only have access groups and project areas set for access control in manual mode as shown in the image below. How to find the objects we are interested in, is explained in this post. To be able to set the access control context for work items, it is necessary to understand how to access the value that represents the access context of a process area (project or team area) or access group. This means, the access context can be accessed already from the item handle e.g. in case only a handle such as IProcessAreaHandle, IProjectAreaHandle, ITeamAreaHandle, IAccessGroupHandle or IContributorHanlde is available. Note, that all items in RTC have an itemID like the one above and can be uniquely be identified by it. Other itemID’s are just not used as access context. This recreates the UUID of the object if the string is a valid string representation of a UUID. This way, you have the choice to use the UUID or its string representation to set the access context of RTC work items. Given the UUID provided by a project area or access group, it is possible to set the access context of a work item. Although all the code to retrieve the access context is common code, the code to set the work items context differs on client and server. In the Client API, use a WorkItemOperation like the code below. * (c) Copyright IBM Corporation 2015. All Rights Reserved. * disclosure restricted by GSA ADP Schedule Contract with IBM Corp.
Because the WorkItemOperation is not available in the server API, a save has to be performed manually like below. Please note, if this is performed in a participant/follow up action, it is important to send an additional save parameter like “WORK_ITEM_CONTEXT_CHANGE”. This protects the participants from causing a recursion ultimately crashing the server. The participant can protect itself to run again for the save it just performed by testing for the additional save parameter. If the parameter is detected, the participant knows it caused the save and should exit to prevent the recursion. Please also note, that in some cases you might have a WorkItemWorkingCopy, instead of an IWorkItem. 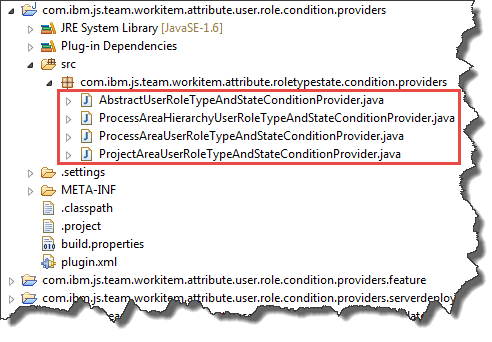 In these cases use a cast or the method getWorkItem() on the working copy to get the IWorkItem item to be able to set the context. The examples above uses the string version of the UUID, however, it would have been possible to get the UUID directly from the IItem. It is possible to get the access context of a work item, if the work item is accessible for read, by using IWorkItem.getContextId(). The resulting UUID can be used to get the related item. This post explains how to set read access control for work items. 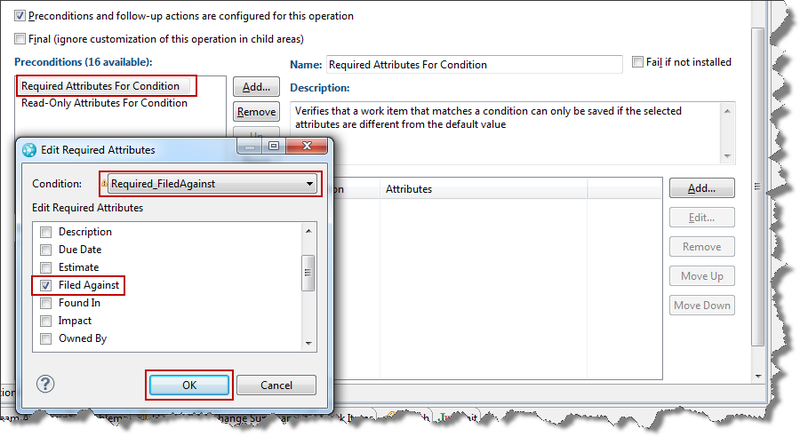 The next post will explain the details around setting access control for SCM versionables. A customer requires very fine grained access control to work items and versionable objects such as files in the SCM system. In addition the customer had the requirement to be able to set attributes on elements in the SCM system. I knew that it can be set for work items and kind of how to because I had briefly looked at it in the A RTC WorkItem Command Line Version 3.0. 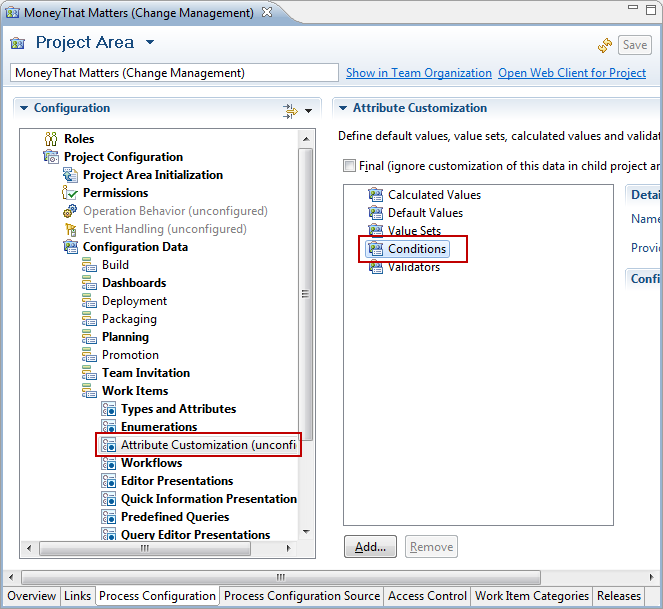 But I was not completely sure about the rules and how to access the SCM part and the attributes in SCM. Since the customer needed this urgently I looked at what the rules are and what can be done. The content is way too big for just one post, so this is going to be a series. The first post explains the rules around access control permissions and some basic API’s around finding the objects that can be used to provide the access control context. The second question was, if it was possible to set the attributes introduced in RTC 5.0 that can be specified and set using the API. The documentation only mentioned the SCM command line. The third question was, how team areas and access groups can be created automatically. Can this be done in the server? Can this be done in the client? Can this be done in a command line tool or from another application? What permissions are required and what are the rules in the different contexts? The approach that we chose was to try to implement a minimal demonstrator to demonstrate the capabilities and prove them as a proof of concept. this demonstrator was also intended to serve as a platform to find the rules. Here is what we learned creating the demonstrator. Work Items have an attribute called “Restricted Access” that can be used to control access to them. There are basically the following modes available for work items that can be used. Option 1: Only the users that have access to the context set for the project area can access these items. This can be set to everyone basically exposing the work items to everyone. Other options a re project area membership and access control list etc. The rules here are very clear. 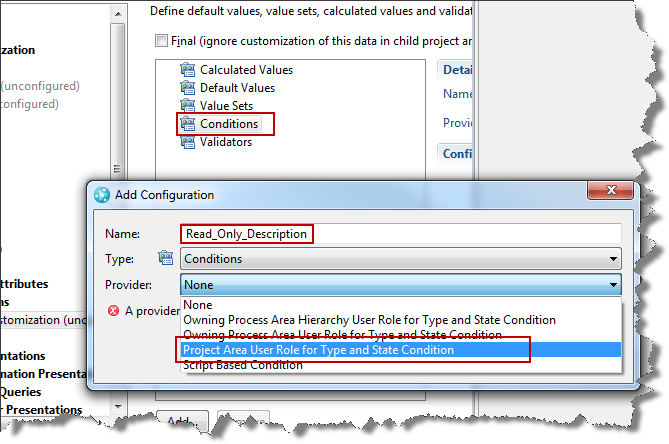 Option 2: It is possible to set RTC in a project area to automatically determine access permissions based on the category (filed against) of the work item. This sets the restricted access to the project area or team area associated to the category. Only members of the team area (and members of sub team areas of the team area associated to the category) have access to the work items which are restricted by category. It is worth noting, that a user being associated to the project area can not look into the work items filed against teams, if these limit access, it is quite the opposite. Option 3: Use a special editor presentation to set the restricted access attribute manually to a project area or an access group. this could potentially be supported by automation. The most important learning for option 3 is, that it is only possible to set the restricted access attribute to a project area or an access group this way. It is not possible to set the access context to a team area. If the context is set to a team area, it automatically picks up the containing project area. This also holds for automation. See this help topic on how to set up the work items to allow setting the restricted access. Prior to RTC 6.0.1, which has just been released, it is only possible to set read access control to the default (which is controlled by the component) project areas, team areas (called process areas if the distinction is unimportant) and a single user. If access control is set to a team area, any member of that team area and its sub team areas have access. Note that this is different from option 2 for work items. If access control is set to a project area, any member who has access to the project area has access to the item. RTC 6.0.1 introduces the capability to set access control to an access group. Only members of this access group have access to the item. This seems to be the best option by far, especially since access groups can contain project areas and team areas which adds their members to the access group. Please note, that access control applies to the whole item and its history. Users with the JazzAdmin repository role have access to any work item or SCM controlled item, regardless of the access control setting. Users with this role (and sufficient licenses) can access all data. Administrators of a team or project area and don’t have the JazzAdmin repository role can not access items that have access control set to a context they don’t have access to. Users can only set the access context of work items or items in the SCM system to an access context that preserves their access permission. It is not possible to find or select an access group, process area the user has no access to/is member of or a different user and set the access context to it. This would remove the read permissions and is prevented. Users with the JazzAdmin role and sufficient licenses however can do this, because they don’t loose read access. All automation can only perform the operations that are permitted to the user that is used to run the automation. This especially means that automation running in the context of a user with JazzAdmin repository role and the required licenses can perform all operations. The user context available in an automation depends on the automation. Follow up actions (participants) run in the context of the user that is performing the operation on the client or the server. They are especially not elevated run in a JazzAdmin repository role, if the user that performs the operation does not have this role. It is also not possible to use a different users or services to elevate the permissions. Preconditions (advisors) must not change the triggering elements. Otherwise the same rules apply as described in follow up actions. 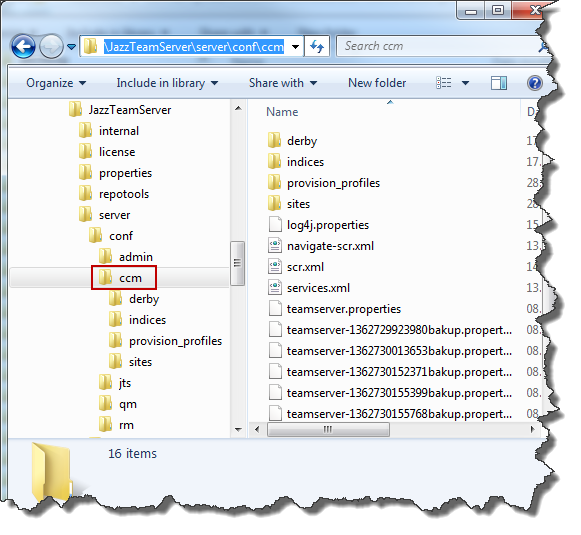 Asynchronous tasks or services in RTC are run with JazzAdmin permissions and can use the IImpersonationService to change the operation to a different user context. Plain Java Client Library or other client based automation run in the context of the user that was used to log into the system. In the context of this post, 1 means, that it is not possible to set access control in such an operation that would remove read access from the user that performs the operation. If you require rules where this could be necessary, it would be necessary to run in a administrative context such as an Asynchronous task or in a client application with JazzAdmin repository role. How to find the access context information needed using the Java API? There are many ways to find ProcessAreas (project areas and team areas) using the API, the simplest one assumes an java.net.URI constructed from a string based name path of the process area separated by ‘/’. Lets assume a project area named TestProject1 and a team area within the project are named TestTeam1 and a sub team area underneath TestTeam1 named TestSubTeam1. The URI for the project area could be constructed from the string “TestProject1”. The URI for TestTeam1 could be constructed from the string “TestProject1/TestTeam1”. Similar the URI for TestSubTeam1 could be constructed from the string “TestProject1/TestTeam1/TestSubTeam1”. Process area names could contain spaces. Spaces are not allowed in URI’s, therefore they need to be replaced by the encoding character string “%20”. To construct an java.net.URI from a string value use the following code. in the server extensions that all extend AbstractService (or in case of SCM server extensions AbstractScmService, which extends AbstractService). for work items and document the fact to save the time to figure it out the hard way during testing (like I did). Work items can also be set to public read access. The constant com.ibm.team.repository.common.IContext.PUBLIC is available for that. provides with the public access context. Access Groups are managed in the administration pages of the RTC application. It is possible to create, modify and delete access groups. The image below shows this section. 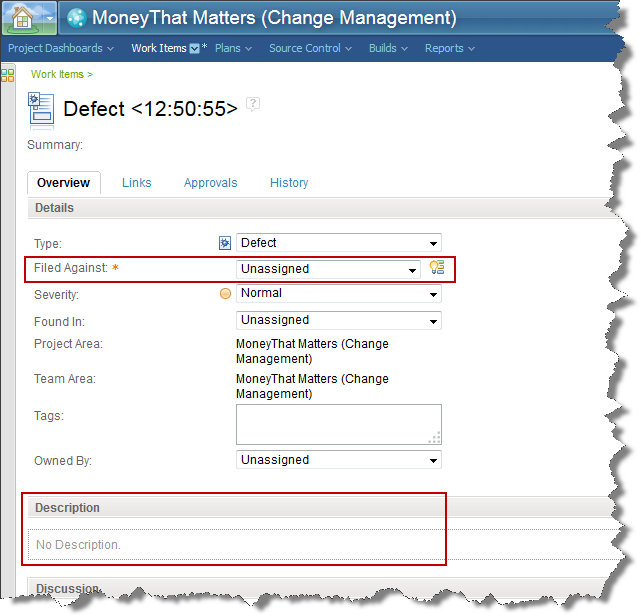 Access Groups are also accessible using the IAuditableCommon common interface that was already used in the section above. This returns all access groups up to a maximal number that is passed to the method. It is possible to pass a filter to select only access groups with specific name pattern like below. The access groups can be iterated like below to compare the name or do something similar. // Compare the value to the access group name. Finding contributors is different in the client and the server. There is no common API available. In the client API the IContributorManager can be used for example using the following methods. 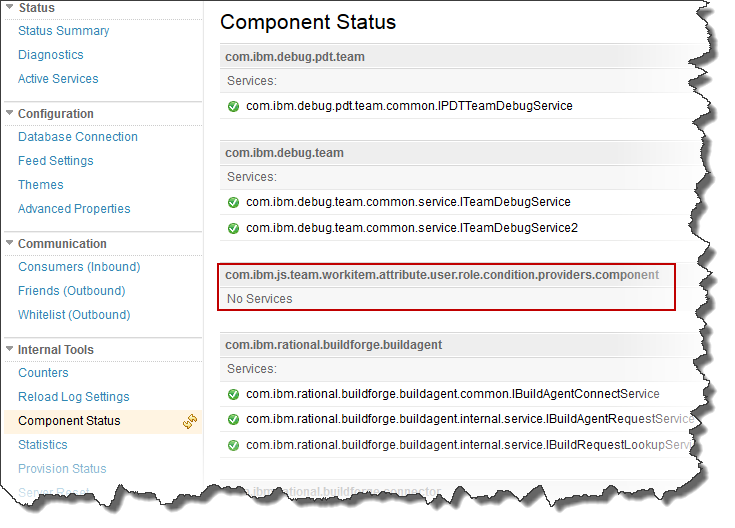 In the server API the IContributorService is available and provides the following method. I was not able to locate a way to search for all users like in the client API. The server API usually gets a user passed and there is no need to find all users. This post explains the rules around read access control for work items and RTC SCM versionables and some basic API’s around finding the objects that can be used to provide the access control context. The next post will explain the details around setting access control for work items. I was interested in how complex it might be to export work items and import them again. So I looked into this and enhanced the work item command line (WCL) to support this. I found it quite challenging to develop this. There are a lot of things to consider, so I drove this to a point that was sufficient for my purposes. The tool is used by my team to import work items from a CSV file we receive every now and then. I implemented another export/import mode with some more capabilities and it works in tests, but is by no means production ready. The amount of necessary tests and test automation to make this reliable, is just overwhelming. So this is not thoroughly tested. So be careful if using these commands, and do a good amount of testing before actually using this. The problem is, there are so many possible use cases and dependencies that it is very hard to develop this kind of capability and to test it. One special case is importing/creating links. Some links have constraints i.e. parent and especially child links. A work item can not have multiple parents. So setting child links can cause the save to fail if the new child has already a different parent. To export work items to a CSV file and import work items from a CSV file. I chose to use a CSV file, because RTC itself can export and import that format already. It would be ideal if export and import from XML would be supported as well, but this would require a substantial effort to abstract the export and import operations to be able to use a strategy (or some other useful pattern to support abstraction). This is provided as-is with no support or guarantee. This is not a tool that is officially supported by IBM or any other organization. Please note, that I have very little time to do this and testing is always lacking. So take the code published here with a grain of salt. On the positive side, you have the code, can debug and enhance it. This code has been used with RTC 4.x and 5.x with no changes and it is pretty safe to assume, that the code will work with newer versions of RTC. The code requires two external libraries that need to be downloaded and installed separately. Update: Added switch to change the export and import formats for dates, see details below. I also added a switch to suppress attribute not found errors and other frequent errors during export. Please note, there might be restrictions to access Dropbox and therefore the code in your company or download location. You should be able to use the following code in this environment and get your own automation or extension working. The code linked from this post contains Client API. For the general setup follow the description in A RTC WorkItem Command Line Version 2 and look at the additional setup steps below. For usage follow the description in A RTC WorkItem Command Line Version 2 and in A RTC WorkItem Command Line Version 2.1. Check the README.txt which is included in the downloads. -exportworkitems /ignoreErrors repository="https://clm.example.com:9443/ccm" user=ralph password=ralph projectArea="JKE Banking (Change Management)" exportFile="C:\aaTemp\Export\Test.csv" query="All" columns="workItemType,summary,Attachments"
-importworkitems  /enforceSizeLimits  /importmultipass  /ignoreErrors repository="https://clm.example.com:9443/ccm" user=ralph password=ralph projectArea="ImportTest1" importFile=""c:\aaTemp\ExportImport\TestExportAll.csv"
In mode asrtceclipse, all data is exported the way RTC would export them in Eclipse. This means that certain information for example links, team areas, iterations, attachments and other data is exported in a way that makes it hard to map to data in the repository. The import command does its best to map based on names, but for complex hierarchical information such as iterations and team areas, there is currently no search implemented that will find the object successfully. It would be possible to implement such methods, with some effort. Example: An iteration is part of a timeline. The timeline is needed to find the iteration within. If there is no information about the timeline, it would be required to iterate all timelines with a good chance of mismatch. The import command will try to find things by name and ID, with the limitations above. If the work item ID attribute is provided as a column the importer will try to find the work item and update it during the import. In the default export mode, the RTC Work Item Command line export command exports the data in greater detail, which makes it easier for the importer to identify the item. In default mode, the attachment is exported as a file relative to the location of the generated csv file. The attachment is downloaded to a location ./attachments//. So for each exported work item with attachments, a separate folder is created. The attachments are stored in that folder and the export information in the csv file is created compatible to the WCL parameter format to allow later import of the attachments, including upload and applying the additional information. Importing work items and recreating the link relationships between them is problematic, because while importing the work items the link target may not yet exist. To be able to import a set of work items and then recreate the linkage, it is necessary to do the import and then map the ID of the old work item to the ID of the new work item. When using the RTC CSV importer in the Eclipse client, existing work items are provided with a # in front of the work item ID. To do an import and then recreate the links between the new work items (and not to the old ones in the import), a user would have to run the import without the links, then replace the work item ID’s in the import file by the new work item ID’s and update the work items with a second import. This is very manual and error prone. The switch importmultipass enables an import mode, where the WCL tries to create the links between the imported work items, rather to the old ones. It imports the work items in two passes. It creates the work items in the first pass and ignores the link creation. In the second pass it tries to create the links. For links between work items WCL tries to find the work items that were created during the import and tries to match the links to the new work items, where possible. Note: Only links between work items are handled this way. Links to objects other than work items are recreated using the values provided in the import file. To be able to do this, the import file has to provide the old work item ID of the work items that are imported. The import requires a special ID for the columns containing the old ID’s. The column header for this column has to be specified with com.ibm.js.oldid. The import file below has been created using an export that included the ID of the work item in the export. The old column header for example ID of the column has been replaced by com.ibm.js.oldid. 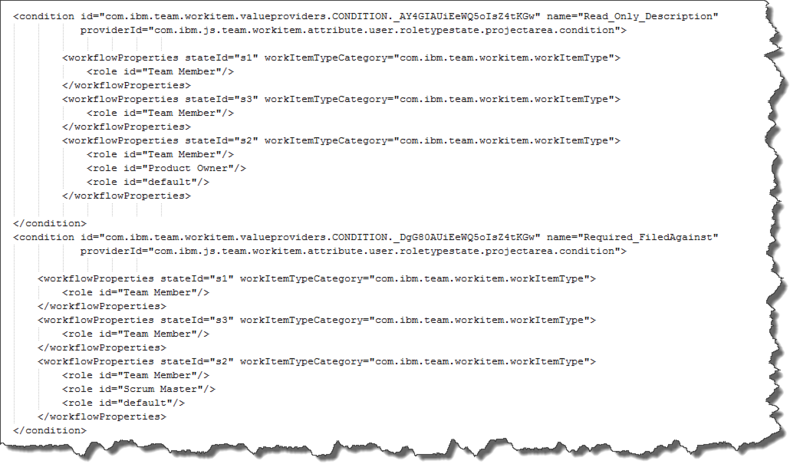 The work item links show the ID’s of the linked work items with their old ID’s. The import works as follows. The WCL runs the first pass and imports the work items. It stores the mapping between the original work item ID from the column com.ibm.js.oldid and the ID of the newly created work item in a map. Links are not created in this pass. In the second pass WCL reads the import file again and only handles the columns that represent links. It detects if the link target represents a work item. If not, it tries to recreate the link as it is. If the link is a work item link, WCL tries to calculate if a new work item was created for the target using the map. If the work item was imported and a new ID is available, the new work item ID is used to create the link. If the ID of the link target can not be found in the mapping, WCL can either ignore the link or it can try to create the link to the original work item. WCL supports these two modes. By default, the link is not created. If the switch forcelinkcreation is specified, the original value of the target work item ID is used as target for the link, if no mapping to a newly imported item was found. Creating links is not trivial. One special case is importing/creating links. Some links have constraints i.e. parent and especially child links. A work item can not have multiple parents. So setting child links can cause the save to fail if the new child has already a different parent. This can create issues in import scenarios, especially if an export from the same repository is imported and the import causes child links to be created that have already another parent. In this case the import will fail with an error. Approvals and comments are imported into one comment. The effort to recreate approvals is just too big and I can’t see the added value. The export and the import commands of WCL need two libraries that are not shipped the downloads. The export and the import commands of WCL use the Open CSV Library. I had issues with the newer versions of Open CSV that I could not resolve, so this code assumes the version 2.3. Download the version 2.3 from here. Uncompress and untar the the file opencsv-2.3-src-with-libs.tar.gz you downloaded. Look for the folder opencsv-2.3\deploy\ copy the JAR file opencsv-2.3.jar and put it into the lib folder of your version of WCL. The packaged version should look like below. If you have imported the Eclipse project for WCL open Configure Build Path and create a user library named openCSV and add the Open CSV library opencsv-2.3.jar. Create a user library named rtcmapping and add the com.ibm.team.workitem.rcp.core library you just copied to it. Your Eclipse Project should now look like below. During the work on import and export, the code structure was left untouched. Some classes were added to be able to handle the column header and some additional mapping of id’s and names i.e. for link types. In addition some of the code that was piling up in the WorkItemUpdateHelper (formerly known as WorkItemHelper) was moved to utility classes. this makes it also easier to look for useful API in case you are interested in how things work in the RTC API. See the scree shot below. This WorkItem Command Line should allow for most of the automation needs when creating work items. In addition it is a nice resource for the RTC work Item API. As always, I hope the post is an inspiration and helps someone out there to save some time. If you are just starting to explore extending RTC, please have a look at the hints in the other posts in this blog on how to get started. Recently I was contacted by a colleague about how to work with work item time tracking, available in the Formal Project Management Process. This is an area of the work item API I had not touched so far. So I decided to have a look at it and share the result. The post contains published code, so our lawyers reminded me to state that the code in this post is derived from examples from Jazz.net as well as the RTC SDK. The usage of code from that example source code is governed by this license. Therefore this code is governed by this license. I found a section relevant to source code at the and of the license. Please also remember, as stated in the disclaimer, that this code comes with the usual lack of promise or guarantee. On the other hand, you have the code and are able to add your own code to it. It would be nice to know what you did and how, if you do so. The code is available for download here. Time Tracking can be enabled in projects based on the Formal Project Management Process. 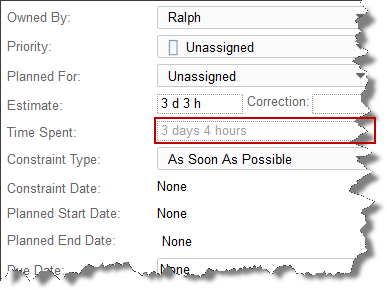 If enabled the user can no longer edit the time spent attribute of work items. Instead the user adds time sheet entries with hours worked on specific time codes on a special tab of the work item editor. The information will be summed up and the total work time will be automatically set in the work item’s time spent attribute. The image below shows the time tracking data. The time spent attribute is read-only and calculated from the data above. In certain circumstances it would be desirable to be able to access the data using the API. The question is, how is the data stored? How can it be read and, most important, how can it be updated using the API? There is a short explanation in the wiki about how the time tracking API works in general. However, this leaves out some very important details. Time sheets are stored in RTC as special objects of type ITimeSheetEntry. These objects are associated to the work item they belong to using a special link type using the end point WorkItemEndPoints.WORK_TIME. It is easy enough to follow the Wiki Entry and create a new time sheet entry. However, I found out the hard way that it is not as easy to update an ITimeSheetEntry. The reason is, that the work item API does not detect an update to a time sheet entry alone. So just updating the entry and then saving the work item will not work. The work item API will detect that no change has been done to the work item itself and not perform a save operation. Since the work item save also triggers the save of the dependent work item data, the save for the time sheet entry is also not performed. Adding a new relationship will also not work as you will end up with multiple relationships to the same item. The only way to update the time sheet data is to force an update to the work item by setting the duration value. This way the API detects that it has to save the work item as well as the time sheet entries as dependent items. The code I finally ended up with looks like below. // Find a matching time sheet if it exists. How does the code above work? First the code tries to find a time sheet entry for the time code and the date that is given. If it can not find a time sheet entry, a new entry is created and the required reference is also created and added to the work item references. This sets the work item to changed already. If a time sheet entry can be found, the code gets a working copy that can be modified. The total duration of all the time spent on time sheets is reduced by the amount of time spent on that time sheet (as if the time sheet duration was set to zero). The data on the tine sheet is then finally set to the current data. In addition the new over all duration is calculated and the result set to the work item’s duration. Finally the time sheet is added to the work item’s dependent items. Updating the work items duration and adding the time sheet as dependent results in both being saved if the work item is saved. A few remarks on the code. If the start date is created with a wrong timezone and time, the entry might not show up in the UI. To fix that, look at the data used in your repository and change the creation of the start data accordingly. To make it easier to use the code above, it is part of a class called TimeTrackingHelper. This helper class implements loading existing time sheet entries into a hash map structure that makes searching for the entry easier. The hash map should allow to iteratively use the helper on the same class if required. If the work item changes, the hash map is built up again. The time tracking helper has code to convert text/string values to the elements needed for a time sheet. It also implements a pattern that allows to iterate the hash map and run an interface on each entry to print the data or do something else with it. 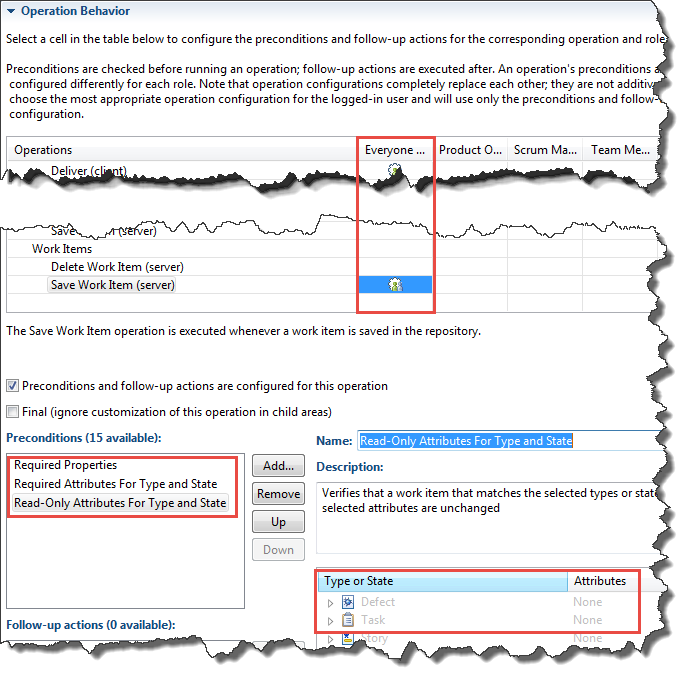 The example below shows how to use the helper in a WorkItemOperation to add a time sheet entry. The interesting part is in the method execute(), where the helper is instantiated first and then used to update (or create) a time sheet. The code below shows how the helper can be used to just print (or access) the time sheet data. The code for the TimeTrackingHelper the example class to modify the time tracking data of a work item called ModifyWorkItemTimeTracking as well as the class to just print the data AccessTimeTracking is shipped with the download. This post shows how time tracking data is managed using the API. As always I hope this helps someone out there to get their job done more efficient. Creating links is not easy. Many things can go wrong. Testing by a user showed that there was an issue with links between work items and build results. I found that I got the link direction wrong. I fixed that. Here is the updated source code. See A RTC WorkItem Command Line Version 3.0 for the latest version. Follow the description in A RTC WorkItem Command Line Version 2 and in A RTC WorkItem Command Line Version 2.1. Check the README.txt which is included in the downloads. If one needs a new command to be run in the WorkItem Command Line, what needs to be done? Lets explore this with the background from the post The WorkItem Command Line Explained. As always, keep in mind, this is not production code, under development and not designed to win a beauty pageant. Testing has not been very thorough, so using this code is at your own risk. The new command is supposed to help with migrating Multi Select Enumeration attributes available until RTC 3.x to Enumeration List attributes available in RTC 4.x and later. As explained in Workaround: Migrate from Rational Team Concert 3.X string attribute used as multi-select lists to RTC 4.X enumeration lists, in RTC 3.x these multi select lists where implemented as a string attribute, that stored the enumeration literal ID’s separated by comma. A special presentation handled input and output. Downside of this approach was, that it was hard to query these attributes and create dashboards and reports. The new way is a special list type for each enumeration. The workaround explains how to use CSV export and import to migrate the data. This solution uses the API to do so. What this solution does not attempt so far is having a mapping that changes the data. Download the latest version that includes the code from this post. The command is supposed to work on work items of a specific type in a project area. The image below shows the source attribute as shown in RTC 4.x with a regular string presentation and the new EnumerationList attribute. 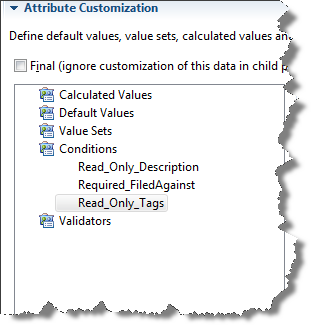 The values from the source attribute have been migrated over to the target attribute. The first step is to create a new command class. As explained in The WorkItem Command Line Explained there are some abstract classes available to be used. The AbstractWorkItemModificationCommand seems to be it, but looking closer, it is very specialized in creating or modifying a work item with a list of provided attributes and values in a parameter list. So the choice here is the AbstractTeamRepositoryCommand instead. In addition to the repository URL, the user name and the password, the command needs to know the project area, and the the work item type. It also needs the parameter for the source attribute ID and the target attribute ID. Some flags like ignoreErrors might come in handy as well. Most of this can be harvested from existing commands like the CreateWorkItemCommand. A few new need to be added. Introducing some constants is a good idea for later. The code added to setRequiredParameters() would finally look like below. The call to super() makes sure the basic parameters for the login process are required as well. The new command needs to be added to the WorkItem Command Line. In the class WorkitemCommandLine add it to the method method addSupportedCommands() like shown below. * Add the supported commands. If introducing a new command, add it here. Now it can be used like shown below. It is also possible to start debugging it using Launches. Now the method process() needs to be implemented. It orchestrates the work to be done. This obviously took some iterations. Here is the final result. throw new WorkItemCommandLineException("Project Area not found: "
"Source Attribute is not a String type: "
"Target Attribute is not an EnumerationList: "
"Work item type mismatch: "
+ workItemType.getIdentifier() + " specified "
// Update all work items of this type. What it basically does is to get the parameters needed for this command and work with them. Keep in mind that the abstract class AbstractTeamRepositoryCommand does the login process already. So what needs to be done is to get the project area, the work item type, the source and the target attribute ID and the flags. Most of the code has been harvested in existing commands as well as in the WorkItemHelper class. The methods migrateSingleWorkItem() and migrateAllWorkItems() will be explained in a bit. There was also a need to be able to access the ITeamRepository in the MigrateWorkItemAttributeCommand. I introduced a getter into the AbstractTeamRepositoryCommand class for convenience. Note, it is always possible to get the ITeamRepository from an RTC object using the getOrigin() method and cast it to the ITeamRepository. However, it makes sense to add this to the framework, too. The final implementation steps are to implement the missing methods as well as add a inner class extending WorkItemOperation, to do the change to the work item. The code is shown below. // Find all work items of this type. + "TeamRepositoryException: Work item "
+ workItemID + " attribute not migrated. " The method migrateSingleWorkItem() basically runs the migration operation for a single work item. It creates the inner class MigrateWorkItem with the data it needs and then calls the method performMigration() to perform the migration. The method performMigration() calls the provided method and does all the error handling. The method migrateAllWorkItems() basically creates an expression to get all work items of the specified type from the project area. The expression is run and performMigration() is performed on one result after the other. makes sure that the built in query limit of the Eclipse client is overwritten to allow getting all possible results. To work it has to be exactly at the place it is. The method performMigration() just performs the call and wraps everything up to be able to process exceptions. The information is provided in the result. The methods above use some additional methods to get the client library IWorkItemClient to be able to perform the query expression. Finally lets look at the inner class MigrateWorkItem which extends WorkItemOperation. I use this approach in all the work item manipulation client API usage, because it conveniently handles all possible mishaps. + " Source Attribute not available - Synchronize Attributes: "
+ " Target Attribute not available - Synchronize Attributes: "
throw new WorkItemCommandLineException("Work Item "
+ " Target literal ID not available: "
+ literalID + " Attribute "
The interesting method here is execute(). It basically checks if the work item has the source attribute and the target attribute. If one of the attributes is missing, it can not run. You have to synchronize attributes first. As last step the method gets the string value and splits the string into its values. The list of enumeration literal ID’s is then used to look up the enumeration literals. In case a literal can not be found, this is an error. If the literals are retrieved, they are put into a list and finally set as the value for the new attribute. The method getLiteralEqualsIDString() is actually mostly harvested from the WorkItemHelper class, where it is used with the literal display name. This change makes the result output much more immediate, especially for long running commands in normal mode. In RMI mode, the data is provided as is, after the call finishes. Some Observations The Parameter handling does not handle optional parameters well. It should be possible to add an optional parameter like the work item ID in this case. However, this is just a minor problem here. In addition at some point it can get so complicated that the automation for printing the command syntax won’t be easily manageable any more. Summary This post explains how to extend the WorkItem Command Line with your own commands. As always, I hope that helps someone out there.